큰소쩍새의 몸길이는 약 24㎝이다. 머리와 등은 갈색이며 턱 밑과 아랫배는 희고, 눈은 붉은색이다. 우리나라에서는 텃새이나 겨울에는 북쪽에서 번식한 무리들이 남쪽으로 내려오며, 소쩍새보다 흔한 편이다. 낮에는 어두운 숲에서 쉬고 저녁부터 활동하는 야행성이다. 작은 새나 포유류, 양서류, 파충류, 곤충류 등을 먹고 산다. The collared scops owl (Otus bakkamoena) is approximately 24㎝ long. The plumage is brown in the head and the back, white in the chin, throat and the belly. The eyes are red in color. A resident bird in Korea, collared scops owls are joined in winter by flocks migrating down from the north after breeding. Collared scops owls are more widespread in Korea than oriental scops owls. The bird of prey has nocturnal habits, resting mostly during the day, inside a shady forest. It feeds on small birds, mammals, amphibians, reptiles and insects. Owls and true owls are today threatened due to the contamination of their food supply. The destruction of their habitats and breeding and wintering grounds is another contributing factor, along with poaching, to their rapidly dwindling numbers. Owls and true owls are protected bird species worldwide. 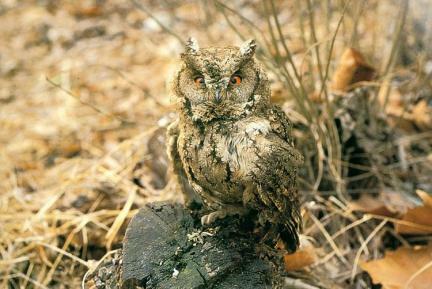 In Korea, seven of the ten locally recorded owl species are protected under designation as Natural Monuments.